Hard drives in my desktop had aged and have been sounding like… Actually the fact of them making sounds is already too much. Computers should be silent. 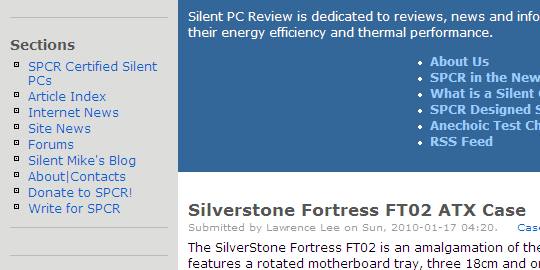 So I’ve been looking around to order new storage (I expect to spend tomorrow swapping it in and cleaning or replacing CPU cooler while at it, CyberTool ftw) and realized that despite past mentions I never got to do dedicated post on Silent PC Review – one of the most focused and thorough sites about silent computing. Site is a collection of reviews – of anything in computer than can make a sound and whole computers, from serial models to DIY projects. Reviews are strongly focused on noise levels and types plus thermal and energy efficiency of components to evaluate their application for silent and low-noise systems. Reviews are beyond usual level of methodical. Building own anechoic chamber to get accurate sound readings for reviews is some serious commitment to the cause. Reviews aren’t free of editorial opinion (not that they ever can be) but it is well mixed with large amounts of hard data. There is obviously plenty of work to cook up such kinds of reviews so site isn’t prolific. It does cover a lot of interesting components but they are only fraction of market overall. As result it is also US-focused. Some categories (like power supplies) tend to have different manufacturers in different world regions so site can fail to provide anything relevant. As for usability – paginated reviews are torturing me. That is just wrong. Excellent resource to find silent components or get an sound evaluation for something you’ve chosen by yourself. If there is no review available don’t forget to hit their forum as well.